Information and Bidding Behavior by Major Oil Companies for Outer Continental Shelf Leases: Is the joint Bidding Ban Justified? The Energy Policy and Conservation Act (PL 94-163), signed into law in December 1975, forbade oil companies that produced the equivalent of 1.6 million barrels of oil per day (mbd) worldwide from bidding jointly for outer continental shelf (OCS) leases. The U.S. Department of the Interior adopted regulations to that effect. The Outer Continental Shelf Lands Act Amendment of 1978 (PL 95-372) modified the 1975 law. This amendment gives the Secretary of the Interior the power to conduct periodic reviews of production rates by petroleumproducers and to ban from joint bidding any person or firm that produced, during a prior six-month period specified by the secretary, an average of 1.6 mbd. 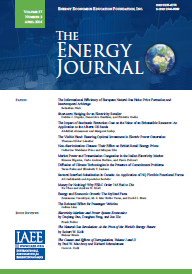 Published in Volume 2, Number 3 of The Quarterly Journal of the IAEE's Energy Economics Education Foundation.